Do you appreciate fine photography? 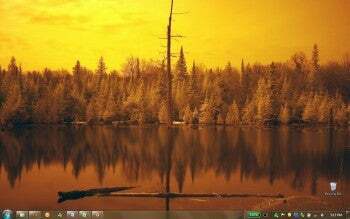 You'll want to download Lonely Landscapes, a Windows 7 theme featuring ethereal and moody scenes in black-and-white and in vibrant color. Most of the images were contributed by members of the DeviantArt community, but their styles are quite different. This quiet mountain lake was captured in vivid infra red. "Cloudy Sea" by Philippe Darbans is a grainy--almost retro--black-and-white image of storm clouds brooding over a dark coastline. Look closely and you can see what looks like raindrops on the camera lens. "IR Lone Tree" by Mike Nebesniuk is a vibrant infrared image of a quiet mountain lake, the stillness of the scene rendered almost ominous by the unexpected colors. In "July Sunset IR" photographer Søren Wrang took an infrared image of the open road and then desaturated it, creating a black-and-white composition with amazing detail. "Jetty" by Flickr member Choh Wah Ye captures a quiet evening harbor scene in Labrador Park, Singapore, with intense blues and bright lights in the distance. Geoffrey Gilson presents a completely different scene in his piece, "The Jetty." Gilson used a long exposure for this black-and-white image of an old, weathered pier jutting out into deceptively quiet waters. If you need a break from a hectic workday, load Lonely Landscapes onto your Windows 7 machine and enjoy. This free Windows 7 theme puts a slide show of moody, ethereal landscape photographs on your desktop.